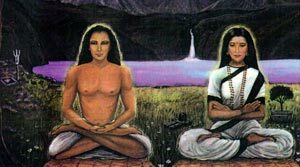 The tantric school of Lord Meru and his twin ray Aramu is the school of ascended consciousness that was bought in at the formative time in Lemuria shortly after we came in from the stars. Lord Meru and Aramu were also incarnate as Lord Rama and Sita, in India, and Garab Dorje and VajraYogini in Tibet. This ascended school was created by a mandala of masters who literally helped create the fabric of consciousness here on this earth., working with the dragons and other spirit beings who hold this planet together. Currently 12 fully ascended twin ray couples hold this mandala in the etheric. These masters include Meru and Aramu, St Germain and Lady Nada, Jesus and Mary Magdalene, El Morya and Yeshe Tzsyogel, Koothumi and St Claire, Mahavatar and Tara, Lord Shiva and Paravati, and others. At the call of Lord Meru and Aramu we went to Peru and were asked to bring out this school. We are therefore the physical anchors of twin ray mastery to bring forth the school at this time. As we were adepts of this school in Lemuria along with other masters, and have completed our training again in our current forms, much of the revelations are in fact very familiar and understood immediately. This knowledge contained within this school is encoded in us, in our beloved earth and within other souls who will reconnect into source again at this ordained time of the ONE light being resurrected here on earth. This Tantric school is a planetary school because it works with the major energy lei lines that carry the light through the earth, and with the consciousness that makes up this earth. The school has five temple sites located around the earth that hold the memories, wisdom of this school. Some of these gifts are called Termas in the Buddhist tradition as they were placed by fully conscious masters into the earth to be released by certain adepts at specific times. As the planet is being reconfigured again for this school to be activated, specific souls who were previously of this school are being called forth by various masters that they are under on the inner planes. These masters work with us so we can meet these souls and bring them in again as initiates. Many of the ongoing transmissions from the ONE ascended body-mind-heart will and must occur within these earth temple sites, as this is what is destiny. The school is an esoteric school whereby the knowledge comes from the inside out, as opposed to an exoteric knowledge whereby knowledge is gained from outer sources. This is a huge distinction, which is at the core of the success of this school. 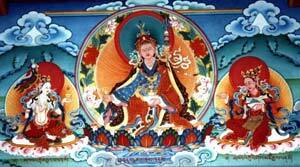 Thus everything gained spiritually is through the process of transmission on the inner planes. Transmissions occur as the body-temple is prepared and able to receive and integrate the light of understanding and revelation that ultimately lead to liberation and full ascension. When a person is ready for re-initiation or initiation for the first time, they are actually initiated from the 12th level at an ordained sacred site, and then the inner work is to bring this eternal light down through the realms into full integration into the physical inner structure. Thus we call the physical body, the body temple, and as a soul is initiated into this school, they then gradually reconnect to the eternal light source of the ascended state. This re-connection to the ONE body-mind-heart is the place where all ascended masters dwell and from where they are calling forth their children who wish to awaken fully either for the first time or again as the eternal light. We are privileged and honored to work for the ascended body in this way, and we also have the mission to re-build the school on the temple site in New Zealand. This school in New Zealand will be an integral part of the Tantric school, and is called the school of advanced learning for the Hu-Man. The temple land will serve as a communal home for initiates-adepts and their children who will be bought up in fully connected consciousness of their eternal essence. These children will not have to lose their connection to their soul as most of my generation has. Thus these young bodies will house fully awakened masters from a very young age. The masters already know the initiates and adepts of this school and so are the souls who will incarnate through them as the next generation of masterful beings. Thus we have an opportunity to change the course of history, whereby each generation pollutes their children’s light by the unenlightened ways and having to effort so much to survive in an unenlightened system. It is with much joy and passion that we present to you who are reading this an introduction to the vision and workings of this school. To understand how you can come into this school, and/or how you can become a financial benefactor of our foundation, you may contact us via email. We stand with you in the blessings presence of the Eternal light and Love. Whitecloud. Click here to read more on the various aspects which make up this school. Where is the New Energy for the Incoming Dispensation of Light? The personal give way to the impersonal, and the yogi, exploding in love, makes the divine a very personal experience. The Ascended Masters are diverse and numerous. They are all fully enlightened beings who maintain a consciousness that instructs and uplifts unenlightened beings. From the state of enlightenment one begins to understand the beginning of the journey of ascension. What is the Solar Disk? © 2019 - All Rights Reserved by Sacred Mountain Retreat and Respective Authors.